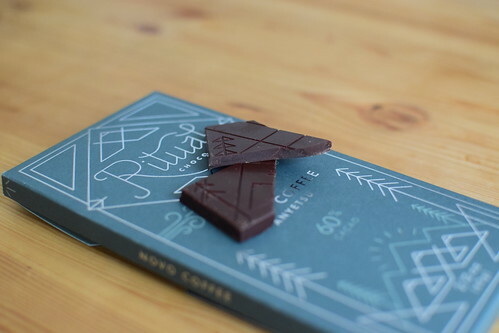 This bar is made using a blend of all the single origin cocoa beans Ritual use, named their mid mountain blend, this chocolate is then combined with a fruity Ethiopian coffee, Anyetsu, supplied by ninety plus and roasted by Novo Coffee. Once harvested and processed these beans are shipped to Park City, Utah where Ritual Chocolate use traditional European methods to turn them into one of their chocolate bars. I’ve tried a few bars with coffee inclusions now and I’ve had a few house blends of chocolate, but my experience with both is somewhat limited. My experience so far is that these kind of bars tend to live and die by the quality of the flavour pairing. The more each product accentuates the other the better, the more the inclusion is designed to be showcased or the chocolate the lesser and where it hasn’t been thought out at all, the worse. 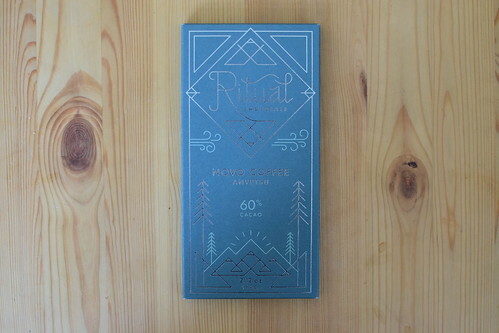 Given the quality of the coffee being used here and the fact that Ritual’s house blend ‘Mid Mountain’ has plenty of awards I’m inclined to expect something of quality here. Some bars include coffee beans and other blend the coffee with the chocolate to impart flavour, this will often affect the texture and delivery of flavour, so far I’ve found the blending to present itself more seamlessly and my hope is that this bar follows suit. I have a general expectation for something fruity here, but ofter chocolate and coffee collaborations tend to include roasted and darker profile notes, so I’m open to both and anything in between. Opening the packaging I’m presented with a slightly darker more roasted brown slab with Ritual engraving in a glossy matte finish. Breaking off a piece reveals roasted coffee aromas that range from ground coffee to brewed with an earthy roasted caramel tone. Placing a piece in my mouth the chocolate has a slightly quicker, but even melt with a glossy and syrupy feel with slightly juicy, jammy textures. To taste this chocolate opens with bitter dark roasted coffee flavours, the same flavour you’ll get if you eat a roasted coffee bean, this initial bittersweet roasted flavour is quickly superseded by a fruity coffee flavour that merges in as the roasted notes fade out. It’s a strange experience, almost synergistic in effect, the delivery of flavour is very much like that of coffee and not chocolate, while all the textural qualities are very much of chocolate. The fruitiness clearly derives from the coffee, while the smooth caramel balanced nature of the chocolate provides the base. Never has chocolate tasted more like coffee and never has coffee had so much of the qualities of chocolate. There’s a bunch of strawberry jam like flavours that result from this and are presented alongside some notes of archetypal chocolate with a slightly roasted finish that has notes of toast or roasted strawberries. It’s a distinctive bar with open expression of flavour and the coffee is well blended with the chocolate for textural purposes, but the amalgamation of coffee and chocolate is not seamless, there’s a clear distinction between chocolate and inclusion. This is a bar for those who particularly like single origin coffee and for those who enjoy open expressive flavours. Best enjoyed with sparkling rose, garibaldi biscuits, treacle toffee or freshly brewed Anyetsu coffee. This entry was posted in cacao, chocolate, chocolate scoring, chocolate tasting, Uncategorized and tagged Anyetsu, cacao, chocolate, Coffee, Mountain Blend, Novo Coffee, Ritual Chocolate, single origin by commoditiesconnoisseur. Bookmark the permalink.